Origin North Sumatra, West Java and Peninsular Malaysia. It is widely cultivated in Sumatra, Ambon, Java, Mauritius, Borneo, Philippines and Thailand. 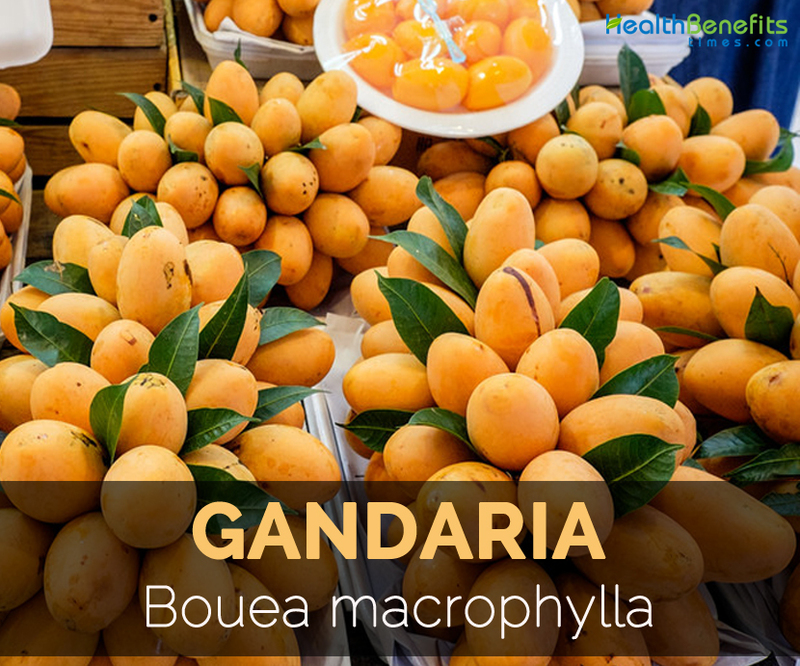 Gandaria is a juicy fruit belonging to the genus Bouea, cultivated mostly for its edible fruit. They belong to the family of flowering plant Anacardiaceae. The Gandaria is native to North Sumatra, West Java and Peninsular Malaysia. It is widely cultivated in Sumatra, Ambon, Java, Mauritius, Borneo, Philippines and Thailand. It was exported to Europe by Thailand. Gandaria is also known as Plum Mango and Marian Plum. The flowering and fruiting season differs in Thailand and Indonesia. 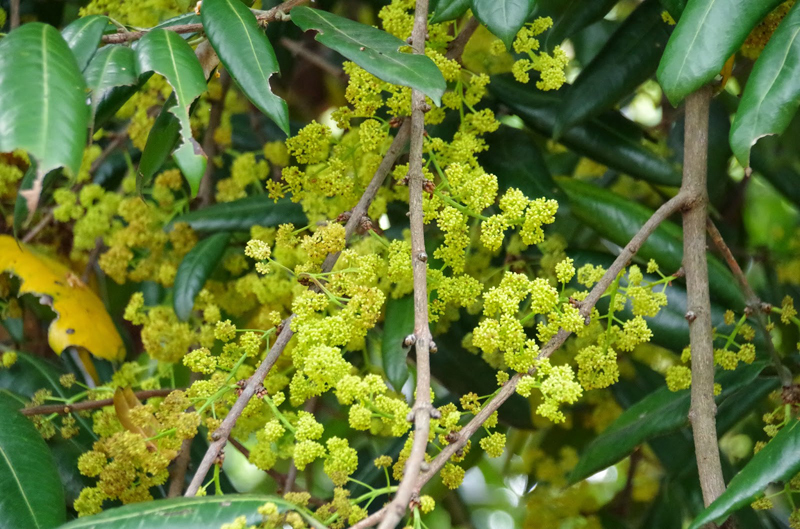 In Thailand, flowering takes place in November-December and fruiting occurs from April-May. In Indonesia, flowering takes place in June-November and fruiting occurs from March-June. An immature fruit has pale green color which changes as the fruit develops. 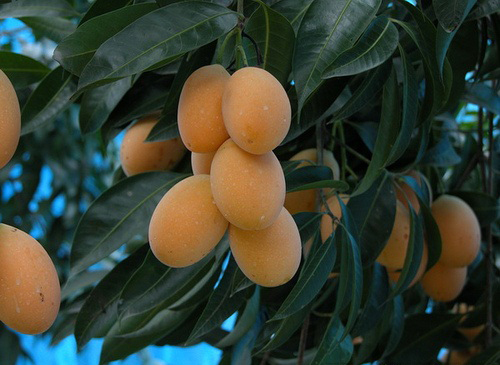 When the fruit gets ripened, it turns yellow to orange, roundish and 4-7 cm long. The fruit has sour or sweet taste with a smell of turpentine. 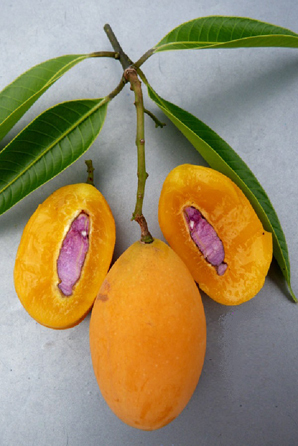 The seeds present in the fruit are small and similar to mango. The endosperm is white, pinkish purple with astringent and bitter taste. Gandaria trees grow upto 27 m high with a trunk diameter of 55 cm. The trees are perennial. 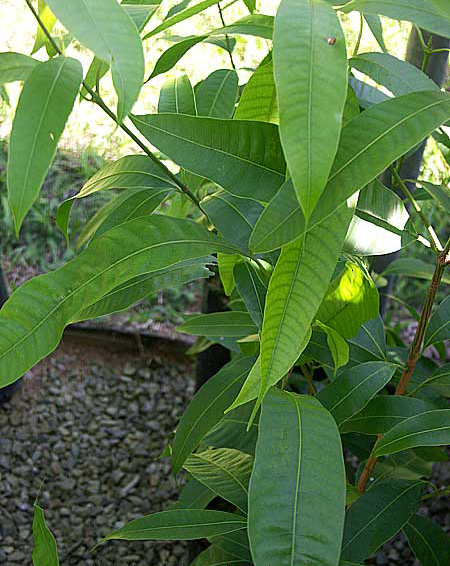 The leaves are elliptic, ovate to oblong to lanceolate, glabrous; 45 cm long and 13 cm wide. The flowers have oblong-obovate petals which are yellowish or light yellowish to green of 1.5-2.5 mm × 1 mm. The fruit is a subglobose drupe, oval-round and 4-7 cm long. Inside its flesh ranges to orangey yellow. 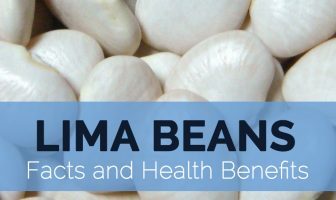 Each fruit contains single seed with blue or violet cotyledon. The fruit has sour to sweet taste. The skin of the fruit is thin, smooth, brittle which is green, yellow or orange. Besides the delicious taste, this exotic fruit provides various health benefits. Gandaria could be added to salads, juice and pickles. This fruit possess high amount of Vitamin C which assist in the collagen tissue formation that helps to nourish skin. Additionally, beta-carotene is also found in Gandaria fruit which is essential for the skin health. The water content helps to moisturize skin which intact the skin health. Gandaria is a great source of protein and Vitamin C which promotes the rejuvenation and regeneration of body cells. The cells regeneration speeds up the time of healing process. It assist in the formation of collagen and protein metabolism. Gandaria has high amount of water which is good for digestive system. Additionally, the fiber assists the absorption process more quickly and smoothly. It prevents precipitation which could cause cancer in the digestive system. The study shows that consuming 26 gm of fiber in a day reduces the chances of cancer. Gandaria helps to prevent the chances of gastrointestinal cancer. The body requires more water for the consistency of circulatory system because our body resides about 55% of water and about 82% of blood is water. This fruit possess high amount of water content. The adequate amount of water in the body assists in the smooth circulation of blood. Our brain is composed of 70% water so the brain needs adequate amount of water for its smooth function. The intake of Gandaria fruit maintains the brain function as it is rich in water content. The body requires sufficient amount of water for the well-functioning of brain. Water plays a vital role in the function of body parts. Water regulates the temperature of the body which is related to the perspiration process. It helps to eliminate the toxins and impurities from the body. The water assists the reabsorption process due to which the waste could be removed from the body. It helps to reduce the chances of heart disease, cancer, diabetes, stroke and other health ailments. The study shows that fiber acts as an effective aid to counteract heart disease. The intake of 26 grams of fiber in a day prevents the chances of heart disease by about 40%. One should consume the diet rich in fiber which helps to evade heart disease. The other organs along with lungs requires adequate amount of water because about 90% of lung composition is water. Gandaria possess the nutrition which helps to maintain the function of lungs. Beta carotene is one of the ingredients found in Gandaria which helps to maintain the eye health. Beta carotene is the nutrient which transform into the Vitamin A benefits which is absorbed by body. Vitamin A helps to maintain the eye health. Fiber helps to low weight. Gandaria contains more fiber in comparison to the fat. Additionally, adequate amount of fiber helps to make the stomach full for long period of time. Mature fruit: Edible with peel, had a light taste of mango. Immature fruit: Edible with fruit salad and condiments. 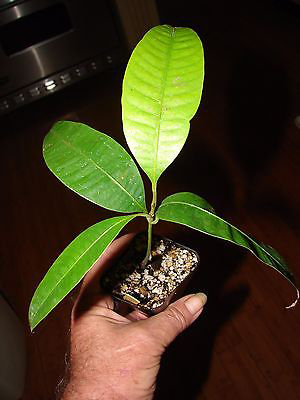 Seed: Edible cotyledons but endosperm possesses bitter taste. Immature fruits could be pickled or added to curries. The mature fruits are cooked in syrup or as an ingredient in the sambal. Young leaves are eaten as vegetable. In Indonesia, the leaves are consumed raw along with rice. Young fruits are added as an ingredient in pickles and a chilli based condiments. Leaves are consumed raw and can added to salads. Immature fruits are used in asinan and rojak. The fruits are used to make drinks or added to stew. The fruit is used to make jam in Indonesia. 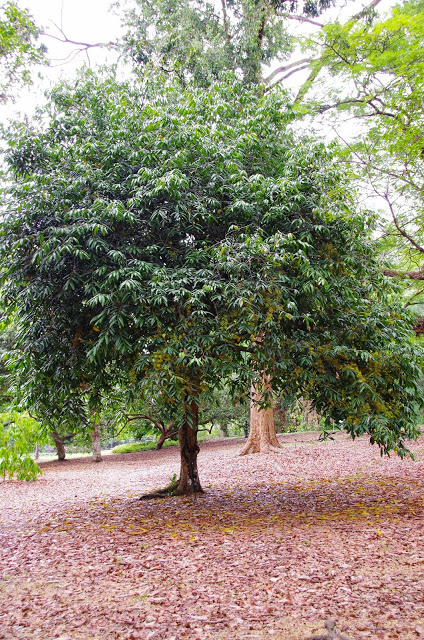 In Java, the leaves are consumed by adding it to salads. In Thailand, the young fruits are added as ingredients for condiment and pickles. Ripe fruits are used to make halwa and dried as snacks. Bouea gandaria Blume ex Miq.